My obsession with finding the perfect lipstick has me wanting to try almost all of the lip products that my wallet will allow me to get my hands on. When I hear good reviews on drugstore products I know I have to go and pick them up because who doesn't love a good formula at a good price. I have heard rave reviews about the Rimmel Apocalips Lip Lacquer line that just recently came to Canada and when I saw them on sale for $7.99 CAD (regular $9.99 CAD ) at Shoppers Drug Mart I knew I had to pick one up.They have a good colour selection ranging from more neutral pinks and nudes to brighter shades. I ended up choosing the shade Stellar because I am a huge fan of wearing a bright lip colour on an everyday basis. 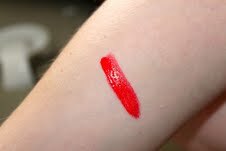 Note how the colour swatch on the bottom of the tube is very similar to the actual colour of the lip lacquer. I love this colour! I haven’t had great experience in the past with liquid lipsticks, as they have always been way too drying resulting in horribly chapped looking lips that even a lip gloss topcoat couldn't fix. 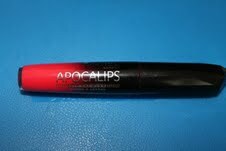 I have to say that I am really impressed with the Apocalips lip lacquers. They are highly pigmented and not drying whatsoever, as long as you put on a lip balm prior to this and let it sink in. The lip gloss applicator also has a tiny hole in the center to collect more product each time you pull it out and the shape of the applicator is really user friendly! I found it best to put it all over the lips and let it dry for about 60 seconds while smiling so that it did not settle into the cracks of my lips. The main reason I wanted to try this product was because my lipstick always gets all over my drinking glasses when I go out and I found after waiting close to 10 minutes I had absolutely no transfer. They also last a very long time when you are just drinking. You will have to reapply after eating because it tends to get patchy on the center of your lips and is pretty noticeable. When reapplying the lacquer I found that layering without removing the previous coat worked quite well and did not look patchy. Although I really am a fan of the Apocalips lip lacquer I find that they do still transfer onto my hand way past those 10 minutes. So even though it won’t transfer onto the glass it will most likely transfer if you kiss someone. This product smells similar to artificial fruit but I am not entirely sure and it is quite strong so if you prefer no scent this might not be for you. Just a note, the smell does go away once the product sets into your lips. Overall, I really do think Rimmel did an outstanding job and I really haven’t seen a product like this in the drug store. I am definitely going to go back and purchase more colours because I love the formula and the shades.